We begin our process by individaully accessing each patient and taking a comprehensive set of measurements, impressions, and photographs. Impressions and measurements are taken from both the residual limb and sound appendage. Using a quick cure encapsulant, the impression process is fast, accurate, and conveniently accomplished with no special facilities necessary. 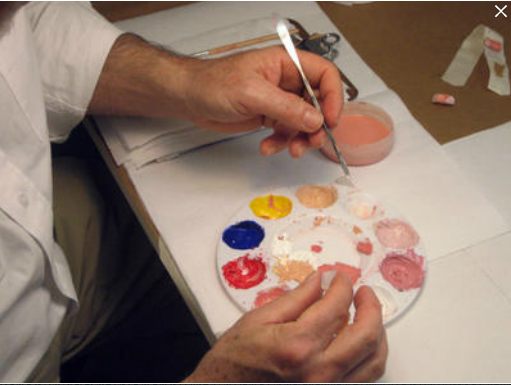 Using models cast from the impressions, an APS artist creates a mirror-image model which will be used to form the prosthesis. Measurements and models of the residual limb are utilized to ensure the precise fit of the finished device. Fine details from the patient’s impressions are incorporated into the reversed model, giving the finished prosthesis an unmatched level of realism. Once the sculpted model is complete, a final mold is created. This mold is then used to cast a translucent high strength silicone rubber skin that contains all of the characteristics of the patient’s own skin. The flexibility of the silicone maintains a high range of motion, as not to limit any recovered function of a residual limb. The silicone skin is also extremely durable and will last for several years if proper care is taken. Colors dispersed in a silicone compound are carefully mixed and applied to the interior of the glove in successive layers. The color is applied with the patient present to ensure a identical match. Because the color is seen through the thin silicone membrane it has the luminosity of real skin. Fingernails are made separately and are also individually colored before applying them to the fingers, achieving the same high level of customization. The color matched glove and fingernails are bonded together using an injection method around the model of the residual limb. This technique creates an intimate, full contact suction fit. The fit is air tight, increasing the patient’s confidence that the prosthesis will not lose suction and slide off. Once the prosthesis is fully cured and thoroughly cleaned, the patient is fit with the completed prosthesis. APS staff will instruct the patient in proper donning and doffing methods of the device, wearing schedule, and maintenance. When the patient is comfortable and the patient’s questions have been fully answered by APS, they may leave with the prosthesis.